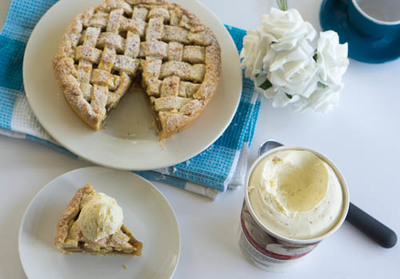 Apple pie tops the list as one of the most popular desserts and for good reason. 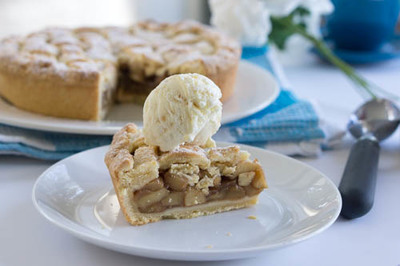 The delicious, soft, cinnamon coated apples embedded in a sweet shortcrust pastry. There's everything to love about it and this version is one of the best I have had. It is way better than store bought and relatively easy to throw together. Plus, the smell in your kitchen will leave you longing to eat it! Serve warm with cream or ice-cream! 8 large Granny Smith apples, peeled, cored and chopped in to 2cm cubes. .First make the dough by combining flour, butter and sugar in a food processor and mix on low speed until it resembles coarse breadcrumb consistency. Add the egg yolk, water and vanilla extract and process until a dough forms. Remove from processor and bring the dough together. Take a third of the dough and shape it in to a disc, and then wrap in plastic wrap for the lattice top. 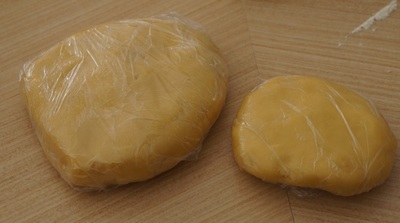 Shape the remaining dough in to a disc and wrap with plastic wrap. Place the dough in fridge for at least an hour. Meanwhile to make the filling, combine the apple, water, sugar and cinnamon in a saucepan over low heat. Cook for about 20 minutes, stirring occasionally, until the apple has become soft but not squishy. Remove from heat. Drain the juice from the apple mixture in to a bowl. Add cornflour to the juice and mix until it has dissolved. Return the juice to the apple mixture and stir until combined. Put aside. When you are ready to make your pie, pre-heat the oven to 180 C and grease a pie dish. Take the larger quantity of dough out of the fridge and place on a lightly floured surface or between two sheets of baking paper. Roll the dough out until you have enough to cover your pie dish. Lightly flour the dough and beginning at one end gently roll it up around the pin and then unroll it in to your pie dish easing it in to the sides and edges. Trim the excess, leaving a 2cm overhang. Spoon the apple filling on top into the pie dish. With remaining dough, roll out the same way as previous step. Cut in to 2cm wide strips. Place 6-7 strips horizontally over the pie leaving a small gap in between each strip. Fold every second strip back half way. 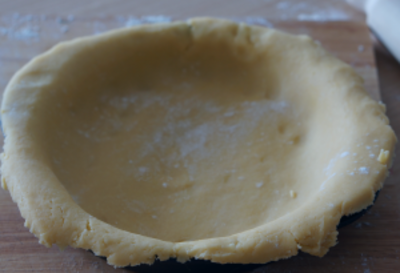 Place another strip vertically down the middle of the pie and unfold the strips back over the vertical strip. Now repeat the process, alternating with the horizontal strips that were not folded in the first step. This will give you your lattice presentation. If you are struggling with the design, you can find a lot of great videos to help you with the lattice design on youtube. 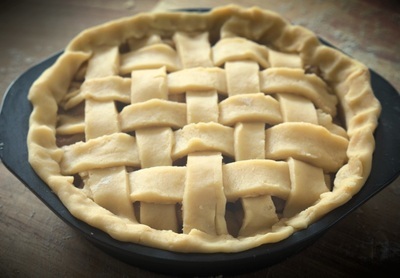 After finishing the lattice design, fold the excess overhang pastry back in to the pie and pinch to give a nice neat rim. 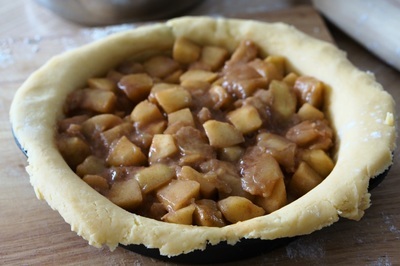 Once the pie is finished, brush the top pastry lightly with water and sprinkle with caster sugar. Bake for 40 minutes or until pastry is golden brown. Serve warm with ice-cream or cream.